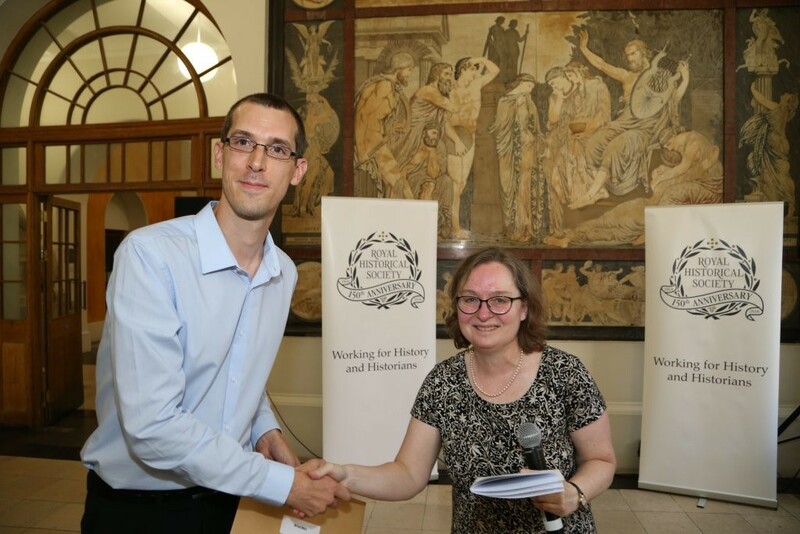 Dr Brian Hall, Lecturer in Contemporary Military and International History, has been awarded the ‘Whitfield Prize for 2018’ for the best first book on British or Irish History by the Royal Historical Society. The award was made in London during this summer, Friday, 6 July, when Brian was presented with the prize by the Society’s President, Prof Margot Finn. His book, Communications and British Operations on the Western Front, 1914-1918, published last year by Cambridge University Press, came out on top in a strong field of seven monographs which were shortlisted for the prize. The Whitfield Prize is awarded for books which are original works of scholarship, they must be the author’s first work, published in English, and by an author who received their doctoral degree from a British or Irish university. Brian’s book was chosen from a shortlist of works by authors who received their PhDs from, among other institutions, the universities of Newcastle, Cambridge, Oxford, Birmingham and Queen’s Belfast. Alaric Searle, Research Lead for Politics and Contemporary History, and Professor of Modern European History in the School of Arts and Media, commented: “This award is a fantastic accolade for Brian. This prize has been awarded continuously since 1977 and no former PhD student from Salford, or member of staff, has ever won it before. Furthermore, it is has been rare for authors of books on twentieth-century history to win; and, as if this was not enough, this is the first time that a straight work of military history has ever won. The Whitfield Prize for History, together with the Gladstone Prize for the best book on a topic not primarily related to British History, are two of the most prestigious early career awards in Britain and Ireland, carrying particular weight due to the central role of the Royal Historical Society in representing the views of academic historians in the UK. The award of the Whitfield Prize to Brian also sees him win in the 150th Anniversary Year of the Society. To mark the launch of the new ‘FOI intelligence and security archival collection’ at the University of Salford, Dr Chris Murphy and Dr Dan Lomas will discuss their use of Freedom of Information (FOI) legislation during their research into British intelligence and security history. They will be joined by Mr Ian Johnston, the University’s Archives & Special Collections Co-ordinator. Ian will be able to answer questions about access to the new collection, and associated opportunities for researchers from across the social sciences and humanities, while Chris and Dan will be able to offer practical tips and advice to those thinking of making an FOI request, based on their own experiences. The event will be held at the University of Salford’s MediaCity Campus (Room 3.10/3.11) and will be accompanied by a reception.